It's been an exciting weekend for Star Wars Rebels fans. At the annual Fan Expo Canada event in Toronto, executive producer Dave Filoni took the stage with stars Taylor Gray (Ezra Bridger) and Vanessa Marshall (Hera Syndulla) to preview the upcoming fourth and final season. The panel debuted the new trailer for season four and announced that the season would begin on October 16th. Then, as a special treat for fans in Toronto, the first two episodes were screened. This was my second time seeing "Heroes of Mandalore Part 1". The first time was at Star Wars Celebration Orlando back in April. But the second episode wasn't ready at that time, making Toronto’s Fan Expo the first time anyone outside of Lucasfilm had seen it. The atmosphere during the screening was electric--more like a rock concert than your average movie-going experience. The crowd cheered our heroes when they succeeded, laughed at Chopper's antics, and gasped when the "big twist" took place. It just goes to show that the best way to watch Star Wars is with an audience of excited fans! I have to be honest, I'm pretty excited about these episodes. I was pretty pleased with season three overall and these episodes felt like they took the best of that season and built on it. 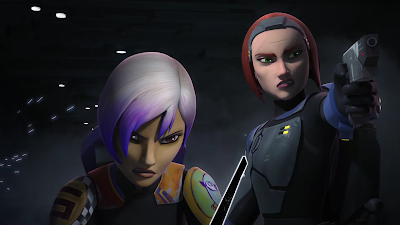 Which is no surprise really--these episodes continue the Sabine/Mando storyline which had the most compelling character exploration (and some of the best action). "Heroes of Mandalore" picks up where this storline left off last season, with Sabine leading a squad of Mandalorians, alongside Kanan, Ezra, and Chopper, in a mission to rescue her father. The episode takes place on the planet Mandalore, last seen in season five of Star Wars: The Clone Wars. Unlike previous visits to the planet, all the action takes place outside the planet's cities, in the barren wasteland that resulted from generations of Mandalorian civil war. The action in this episode is top notch--some of the Rebels production crew's best work. Seeing Mandalorians (with jetpacks!) swooping through the air and fighting alongside Jedi against their common enemy, the Empire, was breathtaking. The first episode is basically one long action sequence, broken up by only a few moments of our heroes planning their next move. The second episode takes a little more time for some character moments, but it too has some moments of awe-inspiring action. These episodes also provide us with some answers about Sabine's backstory, finally showing us the weapon she built for her people that led to her (somewhat) self imposed exile from her fellow Mandalorians. When showing the destruction caused by the weapon, known as "The Duchess," Rebels gets far more graphic than its usual standard--you can catch a quick glimpse of it in the new trailer. There's no blood, but beyond that, the crew doesn't pull many punches when it comes to showing how devastating this weapon can be (ok, maybe they pull one or two punches, but that has more to do with the story than with the visuals). But it's not just the physical damage that "The Duchess" causes that's explored in these episodes. We also see the ways in which it affects Sabine as a character, both in how she is treated by other Mandalorians, and in how she reacts when she comes face to face with the new Imperial governor of Mandalore who is now in control of the weapon. Voice actor Tiya Sircar gives an outstanding performance that really conveys the pain, anger and sorrow Sabine feels over her actions. Between these episodes and last season's "Trials of the Darksaber", Sircar has had some of the most gut wrenching moments to perform of the entire series and she does so masterfully. Also worth mentioning is the return of Bo-Katan, a character we were first introduced to on The Clone Wars as the lieutenant of Pre Vizsla. Later, it was revealed that she was the sister of Mandalore's pacifist leader, Duchess Satine (whom Vizsla was trying to overthrow). "Heroes of Mandalore" marks Bo-Katan’s first appearance on Rebels and we can see that in the time since The Clone Wars she has remained resolute in her drive to preserve Mandalorian culture. That's not to say she hasn't changed, as we definitely get the sense that her opinion of her sister has shifted in the intervening years. The relationship between Satine and Bo-Katan was never really explored on The Clone Wars, so it would be interesting if Rebels could give us some new insights (despite Satine not being on the show because, well, you know). Based on the trailer it seems that a main theme of this season will be "how we choose to fight," and these episodes certainly address that in a significant way (which I can't get into without divulging spoilers). This feels like the perfect theme for the final season of Star Wars Rebels to explore, and if the rest of the episodes can live up to the standard set by "Heroes of Mandalore" then we are in for one incredible ride!